Darrell Jones knows good advice when he hears it, and when his mom told him that he should take a look at Stony Brook University’s journalism program for high school students, he jumped at the chance to try something different. 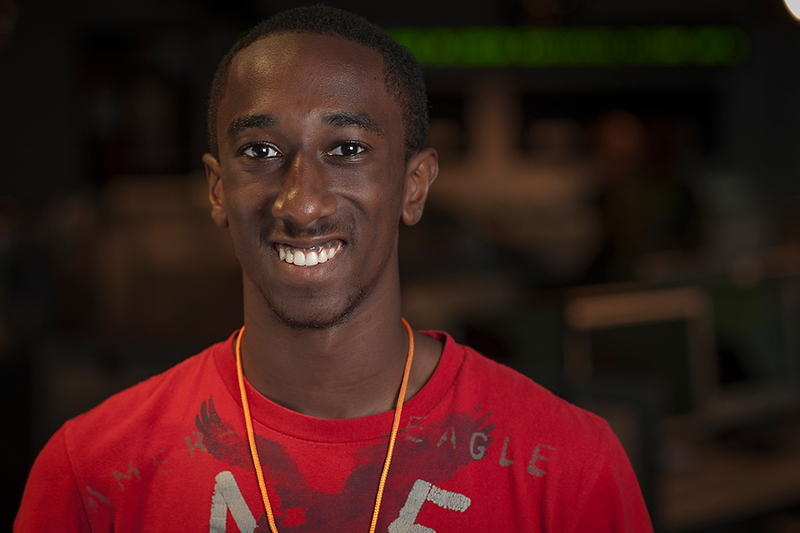 Darrell is the first to admit that he’s probably one of the greenest members of the 2012 Greene Team — he’s never so much as written an article for his school newspaper. But he’s excited to be involved in the program. “I want to learn as much as I can about journalism,” he says, singling out sports journalism as an area of particular interest. This interest will come as no surprise to those who know Darrell, who is already very involved in sports. He plays basketball (shooting guard) and football (quarterback, receiver, corner-back and safety), and he hopes that his background knowledge will give him an edge in reporting on sporting events. “Just knowing about sports and being aware of what is going on during a particular game would be a skill that could be useful in sports journalism,” he says. Darrell’s talents are expressed in other arenas as well. An accomplished alto saxophone player, pianist and singer, Darrell is partial to “upbeat, fun songs” and has been involved in music for almost ten years. He enjoys school—something that has always come easily to him, he admits — and has a fondness for science, although his favorite subject is English. “While I do enjoy free writing, writing about a certain subject interests me because I get to do some digging to find out more about it,” he says, explaining that an interest for in-depth research is what draws him to journalism. As the middle child of three brothers, getting along with others is something with which Darrell has had plenty of practice. Darrell has one other important family member besides his brothers and parents—a yellow lab named “Stony,” after Stony Brook University—the very destination to which Darrell will be heading later this summer, doggedly determined to learn everything he can about journalism.